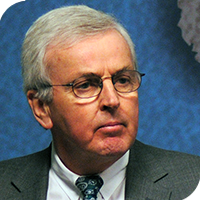 "The Politics of Humanity: Humanitarian Aid Yesterday, Today and Tomorrow"
Sir John Holmes is a British former diplomat who is Chair of the Electoral Commission and Chair of the International Rescue Committee – UK. He entered the Foreign and Commonwealth Office (FCO) in 1973. After spells in London, the UN and Moscow he was appointed to the Near East and North Africa Department then Assistant Private Secretary to the Foreign Secretary in 1982. In 1984 Holmes was posted to Paris as 1st Secretary (Economic), returning to London in 1987 as Assistant Head of the Soviet Department, later moving to India as Economic and Commercial Counsellor at the High Commission in New Delhi. He was Overseas Adviser to John Major from January 1996 and to Tony Blair from May 1997 to March 1999, becoming Principal Private Secretary at the same time. From 1999 to 2007 John Holmes was our Ambassador to Portugal and then France. Then until 2010 he was Under-Secretary-General for Humanitarian Affairs and Emergency Relief Coordinator, appointed by United Nations Secretary-General Ban Ki-moon. He was Director of the Ditchley Foundation from 2010 to 2016. His 2013 book describes his UN experience in The Politics of Humanity: The Reality of Relief Aid.